There is a good flat walking and cycling track from the western side of the harbour near the motorway, extending the length of the Petone beach to Hikoikoi reserve where you can join up with the Hutt River Trail. At the western side you can cross the railway (bridge) and highway (carefully - no bridge, underpass, pedestrian crossing or traffic lights unless you go up to Petone station where there is an overpass) and join up with Cornish Street and the Belmont Regional Park tracks. The promenade is a popular spot in summer and can get crowded. 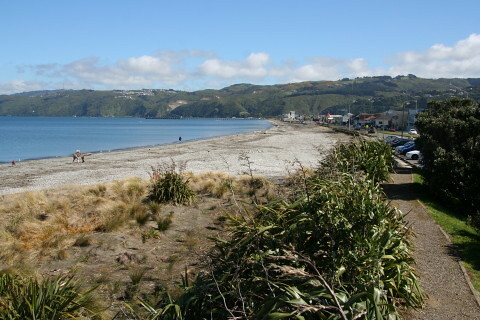 Petone railway station is a few hundred metres north of the beach. You can join or leave the beach at many points along the length.